In our wardrobe, you will find looks that are eclectic yet refined. Comfortable and beautiful linens, cool silk blouses and the perfect weight jerseys are just some options you’ll find. Top it off with a beautiful accessory....jewels,shoes or scarves & handbags that is uniquely you for a look that pleases. Insignias, icons, amulets - each a beautiful addition to your personal lore. Start a new tradition with Waxing Poetic charms, rings, pendants and bracelets...to gift, to keep, to treasure, to delight. Old Bryan Marketplace introduces its new line of jewelry from San Miguel de Allende in Mexico. 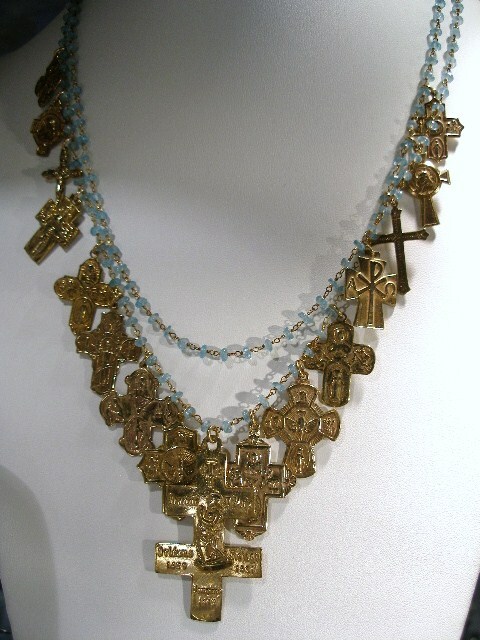 Created by a team of traditional craftsmen using materials native to the country, Virgins, Saints & Angels brings a little bit of heaven to earth with its divinely inspired accessory lines. All Koszyk jewelry is hand-made by artists using Sterling Silver, 14kt Gold fill, Bronze and antique brass. All stones are hand-cut,semi-precious or precious stones including: fresh Water Pearls, Labradorite, Hematite, Onyx, Garnet, Moonstone, Turquoise, Bone, Wood and more. Vintage Forward. Chain necklaces. Pearl necklaces. 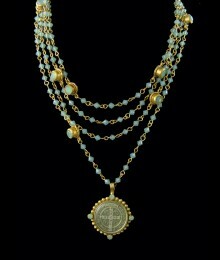 Necklaces with stone, tassels, antique keys, buckles and more. Chunky or delicate. Colorful or neutral. Whether worn with jeans and a tee or your favorite LBD, be prepared to gather compliments wherever you go. Love Tokens is the creation of jewelry designer Stacey DeGraffenreid. Stacey began collecting all kinds of antique medals and had to find something to do with them. She created her unique pearl chain and the Love Tokens line of Jewelry was born. 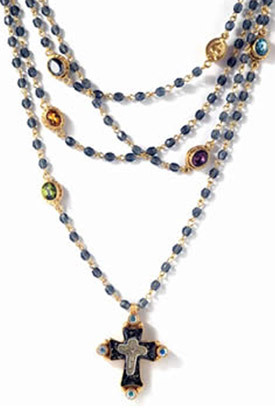 Andrea Barnett's medallion jewelry is a mix of vintage chains, rosaries, and semi-precious stones. All the cut stones used in Andrea's jewelry are genuine semi-precious and precious stones carefully hand selected by Andrea herself. Andrea Barnett Jewelry is a company of all women--except for her only son who helps monitor the bookkeeping. Raised in Israel, with a strong engineering background, Simon Sebbag created a line of sterling silver jewelry that is chunky, yet incredibly lightweight. In 1990, Simon’s wife Denise, with her background in fashion merchandising, joined the company. Together they made the company the success it is today. Each of their pieces are handcrafted in their family-owned and operated factory in Israel. The jewelry is produced using the unique electroforming process. In electroforming, a wax mold is created and inserted into a computerized 925 sterling silver bath. The mold remains in the bath until several thick layers of silver adhere; the result is a light and comfortable piece of jewelry. Finally, the piece is hand-polished to achieve a brilliant shine. Using hand cut semi-precious stones, beads, and colored fresh water pearls, Chan Luu's trademark is her artistic skill in combining unusual forms with beautiful colors to create truly striking pieces which set the trend in fashion jewelry. Chan Luu uses high quality materials such as sterling silver, gold vermeil, leather, fresh water pearls and semi-precious stones. Lenny & Eva Jewelry ........Purveyors of Salvaged Sentiments... Lenny & Eva jewelry line mixes bohemian style with vintage appeal, urban flair and hippie chic to create this unique jewelry line of fashion accessories. UNO de 50 was founded in the late 1990s by a group of designers who resolved to establish a brand of fashion jewellery and accessories that would break all existing moulds. The project was based on the creation of jewels with a unique and distinctive style, which soon became known for their flair and innovation. Over time, UNO de 50’s production and family have grown, although the name has remained in order to remind us that, just as on the very first day, the quality and exclusiveness of each piece are our first priority. The hallmark of UNO de 50 guarantees originality in every one of its pieces. If there is one thing all the designs have in common it is the perfect balance between daring and elegance, the meticulous care invested in every last detail, and an exclusive DNA which makes the brand unique and different. The crafting technique is one of the pillars of UNOde50’s philosophy. The creation of each piece involves a process that is unique in the world of jewellery-making today. From the initial sketch through to the finished item, including the processes of carving, etching and manual refinement, are all done by experts in our workshops in Madrid in Spain, the site of our main offices. The common denominator for all our items is our use of a metal alloy with the ability to bring the brand’s exclusive designs to life, giving each piece that very special handmade texture. Once they have been crafted, the pieces are silver plated, and then undergo an exhaustive quality control, culminating in the assembly of items that combine metal with leather, resins, glass and so on. The lure of Johnny Was is defined by the juxtaposition of beautifully crafted, luxurious, flowing clothing and gorgeous accessories. Johnny Was founder Eli Levite draws inspiration from music and bohemian influences. 100% Linen Clothing. Flax designs celebrate the individuality of women by creating timeless clothing that is comfortable, easy care, and flattering on any silhouette. Flax clothing is excellent quality, beautiful detail, and the most comfortable and affordable clothing you will ever own. Beloved among women who seek natural fibers, whimsical design, loose and casual styles, CP Shades has become one of our most popular lines through the years. Great linen quality you are sure to love and be comfortable in all day long. Designed for customers who want modern, trend-appropriate clothes that balance casual and career with a bit of fashion thrown in. Young in spirit, realistic in fit at respectable price points with quality. It's seasonless, timeless, ageless, clean and sophisticated. Fair trade apparel products. All made in U.S.A.. These leggings introduced the revolutionary "tummy control" everyone of every size seeks. They eliminate "the roll or muffin top" most leggings create and stretch 4 ways. With the hidden control panel and comfort of being tagless they are sure to become a staple in anyone's wardrobe. GRIZAS - Natural design fashion for women. The clothes reflect a synthesis of feminine elegance and comfort. High quality natural fabrics such as silk, wool, linen, cotton emerge through various designs and colors, which gives a unique outcome. We make footwear that's made for you. Whoever you are, whatever you do, you can be sure to find comfort with Acorn. We've found that it's the little things, the details, that make life's experiences the most rewarding, and we think the same goes for what you're wearing on your feet. That's why we've always worked to create products that perfectly combine comfort, style, and quality. Back in 1976, our founder, David Quinn, made his very first pair of slippers with his own two hands as a gift for a friend. Very little has changed since then, we just make a lot more footwear for a lot more friends. Acorn women's slippers, shoes, and socks feature the best quality materials, versatile soles, and legendary Acorn comfort. You're welcome, feet. Volatile footwear satisfies the needs of the customer by offering a diverse line of shoes, sandal and boots that are as unique as the personalities of the people who wear them. 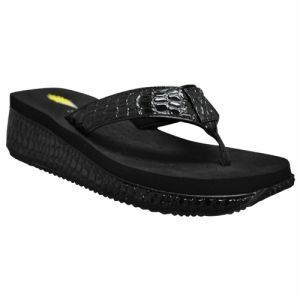 Volatile continues to lead the world of fashion with hot designs that provide comfortable footwear at reasonable prices. The Volatile brand has been seen on the runway of exclusive fashion shows, featured on Project Runway and recognized by magazines such as "Lucky", "People", "Seventeen", and numerous international publications. Volatile is more than a shoe; it’s a lifestyle. In terms of materials, the FLY London range is more varied than ever before, we are dip-dyeing shoes in the entire summer palette, we are making them from waxed canvas, soft canvas, and a new range of chunky leathers that don't need lining, as well as favourites from the past like RUG and MOUSSE... the result is daring, fun and unique. The range is bigger than ever before but completely varied and never repetitive. We at FLY London have enjoyed going where the inspiration has taken us; we like the results and hope that you do too. Don't walk, FLY! BioNatura design Made in Italy of Comfort. BioNatura is a product exclusively made in Italy, characterized by high quality materials, cutting edge design at a very affordable price. They are assembled by highly experienced and highly qualified craftsmen of Italy. BioNatura is only made of natural, high quality materials, resulting in a shoe in which your foot is always in contact with natural products only. BioNatura soles are made with quality materials. All BioNatura insoles are agglomerate cork footbed with suede leather. All Leathers used to make BioNatura uppers have been carefully selected by our experts, and all accessories are made with hypoallergenic materials and nickel free. Comfort, natural materials and design entirely Made in Italy, simply BioNatura. WABAGS are goreous bags created from vintage and unique fabrics and materials. Embroidered vintage one of a kind shopping totes. These handbag are hand-crafted fashion items which were created using hand-made vintage Hmong tribal fabrics. The Hmong women of China, Thailand, Laos and Vietnam, are highly skilled in their creation of beautiful and intricate needlework. The vintage fabrics that we use were traditionally used by these Hmong women as traditional clothing for celebrations including their New Year, marriages, births and other important events. Cross stitch, needle weaving, embroidery and other techniques were used to create this vintage fabrics. Trendsetting. Surprising. Sophisticated. Filled with vibrant colors and timeless design with a modern twist, these bags and totes live up to Rowallan's tradition of quality craftsmanship at reasonable prices. Each piece is designed with the Scottish philosophy that states beauty and function don't have to be mutually exclusive. Hobo was founded in 1991, in Annapolis, Maryland on Toni Ray’s dining room table. Toni created unique accessories for years as the co-founder of cool leather shops in Washington, DC. In 1991, she cashed in her life-savings and headed for New York with her daughter and future son-in-law, Koren Ray and David Brewer, to sell the first ‘Hobo’ collection. Her philosophy for Hobo; women’s accessories should be both stylish and practical. Twenty years later, Hobo has come a long way from the dining room table, but Koren and David Brewer still follow the brand’s heritage spirit of crafting smart, stylish accessories. Beauty shouldn’t feel exclusionary. Consuela celebrates the funky, the cool, the out there, the classic, the hip, the new, the old and everyone in between. Tula hats are made with sustainable fibers and are fair trade. Along with being fashionable they are highly functional. Tula Hats are rated UPF 50+, the highest sun protection rating. This is due to the tight weave of the palm. Protect your skin from sun damage this summer!